It’s officially October, which means it’s time to dive into all things Halloween! (Although, let’s be honest…I don’t let the date stop me from celebrating a little bit early 😉 ) One of my fave sweets to enjoy during this spooky month…? Caramel apples! But I’m not just planning to eat any old boring caramel apple this year. 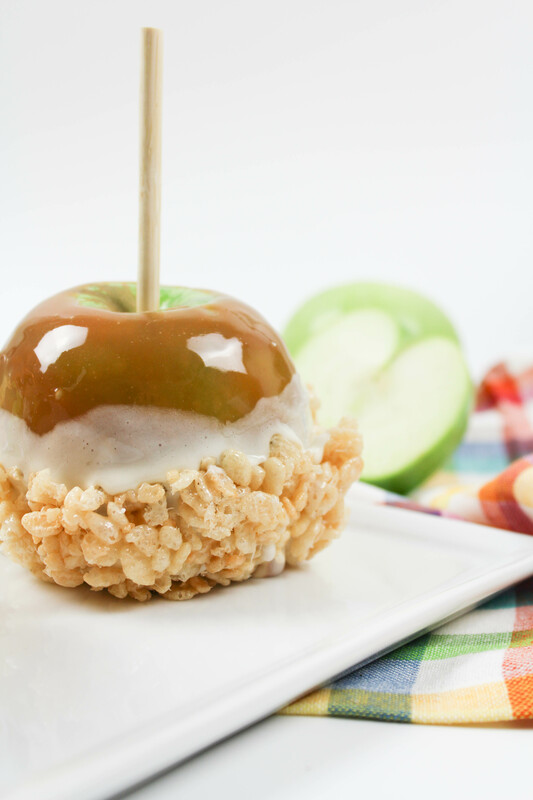 I’m making these marshmallow cereal treat caramel apples! The recipe for these marshmallow cereal treat caramel apples is super easy and involves using a variation of the basic rice krispy treat recipe that you’re already so familiar with. 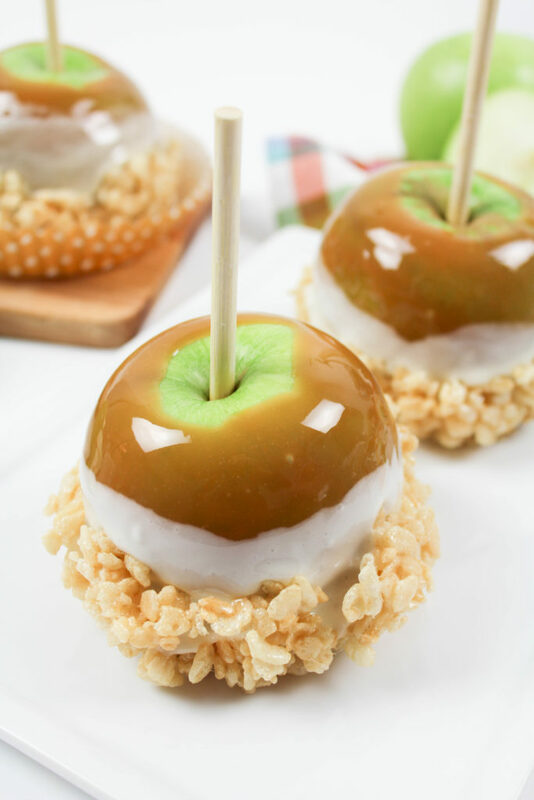 But the addition of a crisp apple, a sweet and gooey caramel layer, a marshmallow layer, and then topped off with a marshmallow rice krispy bottom, takes these Halloween treats to another level. 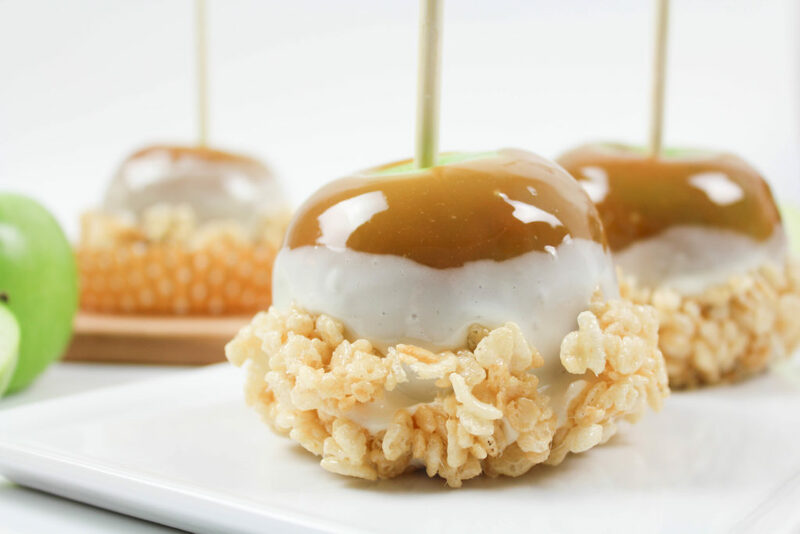 But enough talking…let’s get started so you can make your own batch of marshmallow cereal treat caramel apples! There are some tips and tricks to use if you want to end up with perfectly dipped caramel apples. Before starting to dip your apples, make sure to wash them, remove the stems, and remove all produce stickers in advance. Use a scrubbing brush or pad to remove the wax off of the apples. Having a clean apple will allow the caramel to stick better and won’t run, as it would on a waxy surface. Pop some wooden skewers, or candy sticks into the centers of the apples. I like to use a hammer to make things easier on myself. I prefer to use granny smith apples, because the tartness of the apple really compliments the sweetness of the caramel and toppings, but it’s definitely a personal choice. If you go with red, pick either a Pink lady, honeycrisp, or gala apple. They tend to be the best red apple choices. The red delicious variety tends to get too soft for a good caramel apple. Keep your apples in the refrigerator for at least 30 minutes. Cold apples will help the caramel set quicker and prevent it from running off of the apple. Before starting your apples, line a baking sheet with parchment paper and ensure you have enough room in your fridge for the baking sheet to fit. Prepare your caramel according to the directions on the package. Allow it to get really smooth before starting to dip. When dipping the apples, use a dip and spin technique to really cover the apple well and ensure it goes on smoothly. Allow the excess caramel to drip off of the bottom of the apple and then use a spoon to scrape the excess off of the bottom. Flip the apple upside down and hold it that way for about 20-30 seconds to allow the caramel to set. Then place the dipped apple onto your parchment lined baking sheet. Continue to dip all of your apples and then place them into the fridge for at least 30 minutes before moving onto the next step. Once, your apples have chilled, it’s time to move onto the marshmallow phase! (Keep the apples in the fridge while you are prepping the marshmallow). First up, prepare the marshmallow krispy treat topping. Melt 1 1/2 Tbsp. butter over medium heat in a medium pot, then add in half of the bag of mini marshmallows. Mix until melted. Add the rice krispy cereal to the melted marshmallow and butter mixture and stir until combined. Pour the finished marshmallow cereal out onto a baking sheet and let set. In another medium pot, melt the remaining 1 1/2 Tbsp. of butter. Add in the remaining half of the marshmallows and stir until melted. Remove the caramel apples from the fridge and begin to dip each one into the melted marshmallow mixture. Follow the same directions for the marshmallow as you did for the caramel, to allow it to set before adding the cereal topping. Cover the apples about halfway up with the marshmallow, so that the caramel layer shows through the top. Once you’ve flipped the apple upside down and held it for about 20 seconds, use your hands to gently apply the rice krispy treats around the bottom portion of the apple. In order to completely cover the bottom and make sure it’s not a mess, use your hands. Rolling the apple in the cereal with just leave you with an ugly and very messy finished apple. You can choose to cover the entire marshmallow section in the cereal treats, or leave some of the marshmallow layer showing above the cereal. Once you have covered the bottom of your apple, place the apples back onto the parchment lined baking sheet and pop them back into the fridge to set for at least 20 minutes before serving. You can’t ever go wrong with rice krispy treats, but these marshmallow cereal treat caramel apples sure are another sweet way to enjoy them! 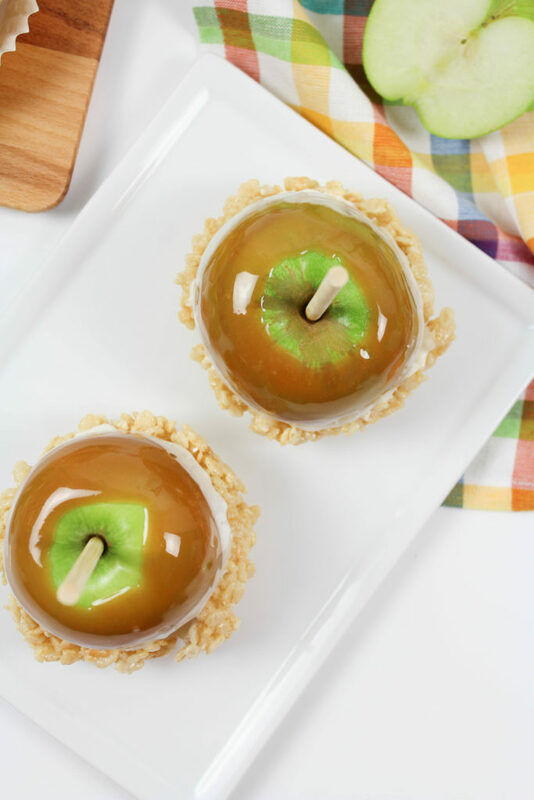 Feel like trying another fun Halloween caramel apple? These guys are too cute to eat! LOVE. THIS. IDEA. 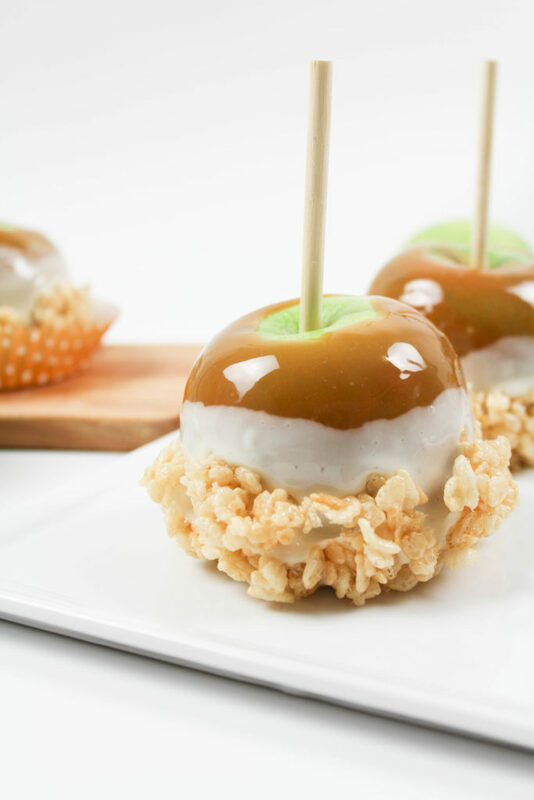 It’s a caramel apple and a rice krispie in one! Perfection! These apples look super good!